TRV installation – time for a change? In many parts of the UK thermostatic radiator valves (TRV) are invariably installed vertically and mounted at the bottom of the radiator. But is this common practice necessarily the best way to maximise the full potential of these energy saving heating controls? Bjorn Sejr Nielsen, Business Development Director at Danfoss Ltd, pioneers of the TRV, considers the case for a change to top and horizontal TRV installation. Fitting individual room temperature controls, such as TRVs, is among a number of requirements for new buildings, and existing buildings when heat generators are replaced, under the 2018 Energy Performance of Buildings Directive (EPBD). With space heating and hot water accounting for over 60% of a typical domestic energy bill in a year, the heating system – and how it is controlled – can have a big impact on fuel costs. With this in mind, the new Directive states that the installation of self-regulating devices (for example TRVs) should be considered for the separate regulation of the temperature in each room or, where justified, in a designated heated zone of the building unit. Properly selected and installed, TRVs are proven to provide accurate temperature control in individual rooms, reducing heating costs and enhancing comfort for consumers. In addition, they are quick and easy to fit in new or retrofit installations, which is another important factor for installers and their customers. Needless to say, manufacturers of heating controls like Danfoss, and the wider heating industry, have welcomed the new EPBD requirements as recognition of the energy saving value of relatively low cost, short payback solutions like TRVs. The benefits of installing TRVs in terms of improved user comfort and heating system efficiency are widely recognised – and as already mentioned they will be a mandatory requirement in certain applications under the revised EPBD. However, does the method favoured by many installers of fitting TRVs in what is often referred to as Bottom Bottom Opposite Ends (BBOE) deliver optimum performance – or is it time to consider an alternative? 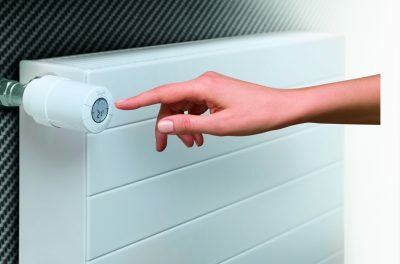 On mainland Europe and in Scotland, for example, TRVs are generally installed Top Bottom Opposite Ends (TBOE) with the TRV feed at the top and the outlet on the opposite end at the bottom of the radiator. So what are the advantages of adopting this method as opposed to the BBOE approach? Firstly, there is the obvious issue of easier access to the TRV if a manual adjustment is required. Put simply, when the TRV is at the top of the radiator, rather than the bottom, users don’t have to bend down to reach it. In addition, it is much more difficult to try and read the numbers when the sensor is down at floor level in a dimly lit area. Whilst TBOE installation does, of course, offer these advantages to all users it can be of particular benefit to the elderly or to complement Part M accessibility design considerations for properties occupied by the disabled. As well as the access issues, when a TRV is mounted at the bottom of the radiator it may be masked by furniture. To work efficiently, a TRV needs a free flow of air to sense the air temperature around it. Any obstruction to this free flow is likely to make the device think that the room temperature is higher than it actually is, resulting in a false temperature reading and inaccurate operation. There is also an important efficiency factor in recommending that the inlet and the outlet are at opposite corners of the radiator. If both are at the bottom the hot water can simply pass through the radiator without necessarily heating the top. Installing the TRV to the top ensures better coverage of hot water through the radiator. A bigger surface area to heat also means that the return flow temperature is lower, so the boiler is more likely to be operating in condensing mode for increased energy savings. A further benefit of mounting the TRV at the top is that any dirt and rust particles from pipework and from inside the radiator are more likely to settle inside the radiator, rather than being transported around the system. Of course, we shouldn’t ignore the fact that there is sometimes an aesthetic reason for installing TRVs out of sight at the bottom of a radiator. Indeed, many might say that the BBOE method has become the norm for most UK installers because it “looks nicer”. But is this consideration really worth the cost of compromising the TRV’s performance and the potential energy savings? Also, unlike their bulky manual predecessors, today’s smart electronic TRVs feature sleek, contemporary styling and often come in a choice of finish to blend in with interior décor. Having considered some of the reasons for switching to TBOE installation of TRVs, let’s take a look at some of the advantages in fitting these devices horizontally rather than vertically. The vertical attitude tends to be the preferred option for most UK installers but this common practice means that the TRV sensor is placed immediately above the hot water pipe. This is likely to create a false temperature reading and affect the TRV’s ability to maintain the set room temperature: if the TRV is installed horizontally this is not an issue as there is less flow temperature dependency.